Apple watches are all the rage at the moment. With the launch of Series 4 in September, it has now become to smartwatches what the iPhone is to smartphones. Apps like Spotify have their own official app for these watches. If are looking to style up your watch there is definitely no better alternative to getting a new Watchband. And when it comes to bands, there are quite a few options that you could choose from. 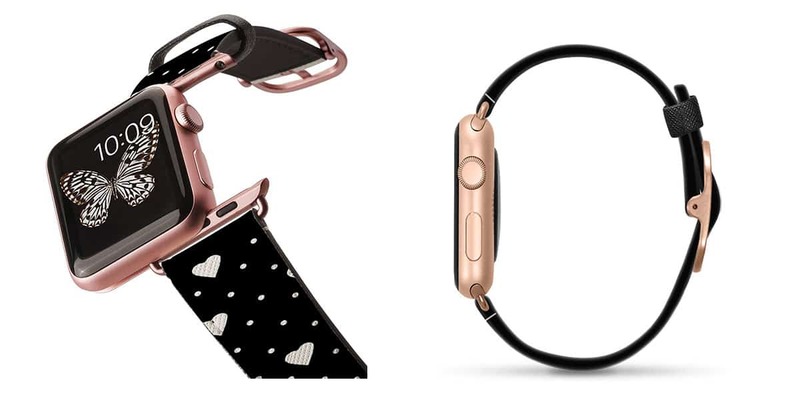 Apple itself offers a wide variety of bands to style up your smartwatch. Problem is, most of these first-party bands are quite expensive. 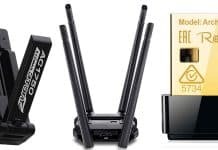 Luckily a lot of these have great third-party alternatives that are available for a fraction of the original price. In this article, we will be looking at some of the best Apple Watch bands available in the market for 2019. Design wise, obviously, different people will have their own preferences. So we have chosen to list based on their prices instead. Also, it is worth noting that although the new Watch Series 4 comes with a slightly larger body compared to the older versions, it still supports all of the old Apple Watchbands. So, without further ado, let’s get started! Here’s a quick summary of the list to follow. 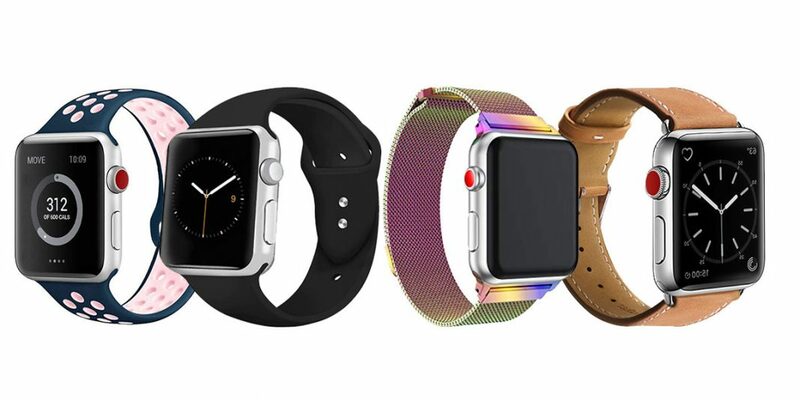 Although, technically, all of the Apple Watch bands listed below are more budget friendly than their respective first-party alternatives, we will be starting with some of more high end bands available in the market right now. And just like our PC cases review, we will gradually move on to the more budget friendly options. Detailed reviews below. Strapa’s Crocodilus is a high-quality leather band crafted from carefully selected Italian calfskin. Also, this is extremely durable. The straps are lined with smooth backing and high-quality stitches with durable linen thread (just like in traditional leather-working). All these qualities help make it extremely durable, by preventing stretching and morphing. Also, the crocodile pattern that is embossed in this gives it a luxurious look and feel. And the buckle was designed to ensure that it both matches the Watch and also doesn’t damage the strap in the long term. This band is a perfect homage to the very origin of Strapa. The company originated in the Netherlands to create Watch straps that are rugged, beautiful and timeless. The straps themselves are produced in one of the finest tanneries in Italy. 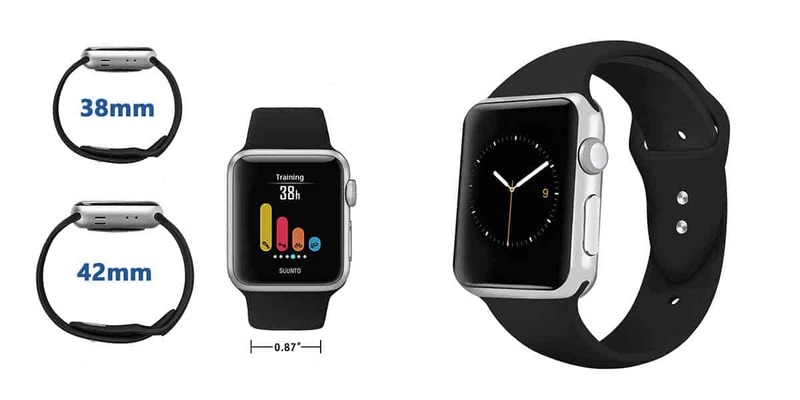 One size will fit everyone’s wrists (150mm to 200mm). Is compatible with every generation of Apple Watches, including the series 4. Can choose between brushed buckle or polished buckle to match the regular aluminum and the stainless steel Apple Watch respectively. Free world wide shipping from the manufacturer. At around $140, this is quite an expensive. Casetify’s Classic Lady for the Watch is another great strap from Casetify. But unlike the previous entry, the classic entry is a leather band. These saffiano leather are both water and sweat resistant, meaning you could wear them when you go swimming or to the gym. Perhaps the most interesting thing about this band is the many, many color options available. You could choose a color that perfectly matches your being. The cross-hatch finish and scratch-resistant finish also ensure that these are perfect for those on the move. Both fashionable to look at and durable, Casetify’s Classic Lady is a fine for your Watch. And don’t let the name fool you. The company also offers Classic 1970s men’s version of the band. Has a beautiful and elegant design. Is sweat and water resistant, meaning it would be perfect for workouts. The polished stainless steel buckle is available in three different colors. Build quality can feel a bit inexpensive. Perhaps one of the most interesting bands on this list so far, Speidel’s Twist-O-Flex is a nice and affordable. Speidel has brought the iconic stretch metal design. It is made of two sets of stainless steel links that are held in place by a set of pins, thus allowing the band to stretch. The lengths are customizable and these are known to be both extremely comfortable and durable. And the brushed satin finish on the top shells of these makes them extremely stylish to look at. Stainless steel build that is strong and highly resistant to sweat and water. Variety of sizes available, so that you could find one that fits your wrist perfectly. Variety of colors available, to match your style. The coloring at the bottom of it is known to wear off after some time. Could feel slightly heavy on the wrist. Changing the links will take some effort. 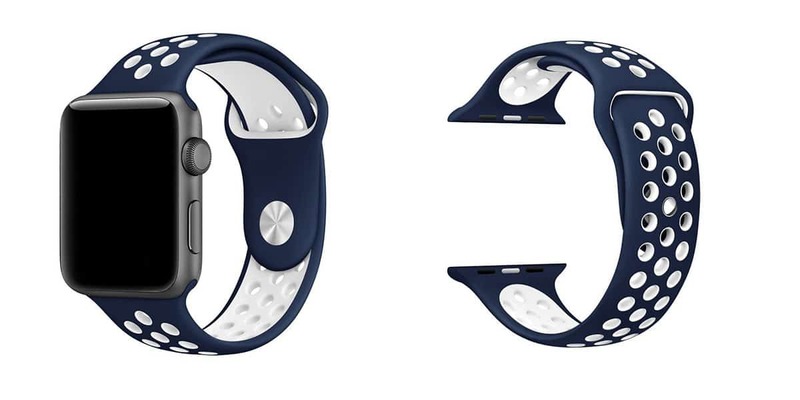 Nike’s Sports band for the Apple Watch is great to have if you’re the kind that regularly hits the gym or follows any kind of exercise routine. These sweat and water resistant bands are made of the high-performance fluoroelastomer. They have compression-molded perforations that act as sweat-releasing holes, that ensure maximum breathability. Not only are these strong and surprisingly durable, but they’re also soft and comfortable. And the pin-and-tuck mechanism ensures that you always get a comfortable fit. Being a Nike product, it’s no surprise that these are considered to be one of the best for sporting purposes. They are also one of the bands officially recommended by Apple and can be bought off of their website. These are the only first-party we’ve included on this list and for good reason. The perfect band to go running, swimming or wear to the gym. Is compatible with every generation including the series 4. Comes with plenty of holes, helping you avoid clammy wrists. Price seems a bit too much for sport. 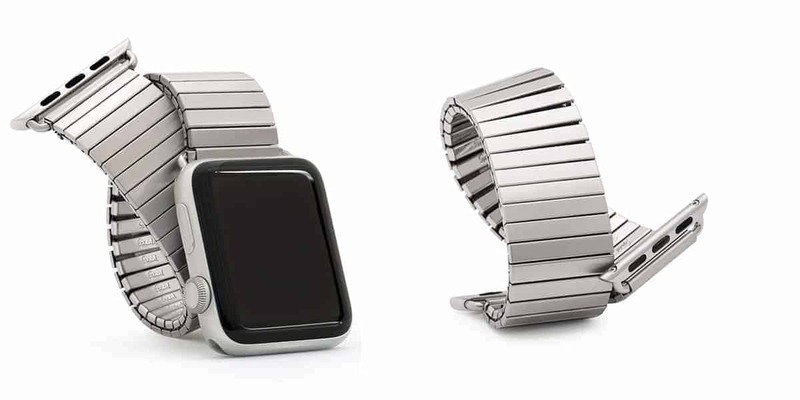 Oittm’s stainless steel for the Apple Watch is a fancy looking link bracelet straps that fits all models of Apple Watch. 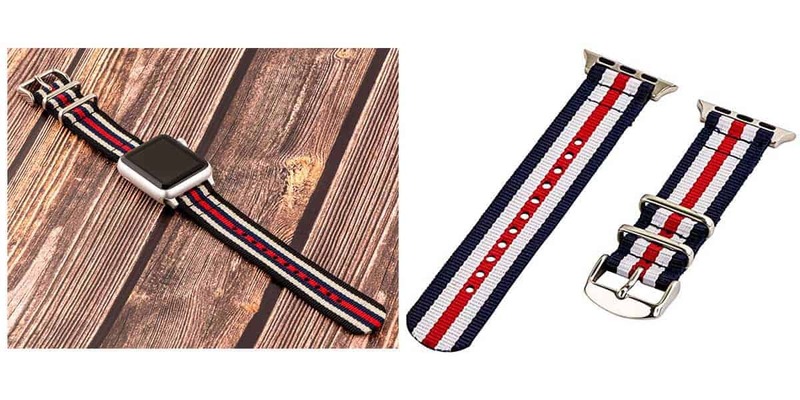 These straps are made of high quality (Type 304L) stainless steel and feature a unique double button folding clasp that guarantees firm closure. 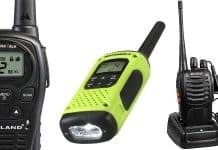 They are also waterproof and are available in a range of color choices. Perhaps the best thing about this is the ease with which the links can be added or removed from the link bracelet to get the perfect fit. This can be done with the removal tool that comes with it. Oittm’s stainless steel band is a great affordable alternative to other high priced stainless steel straps offered by Apple. Crafted using high quality stainless steel (Type 304L). Adjusting the size is easy thanks to the way the links are positioned in the design. Comes with a 30-day money back guarantee and a 12-month warranty. 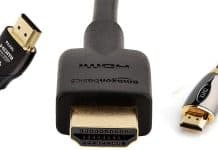 The link replacement tool that comes with it is reportedly prone to breakage. 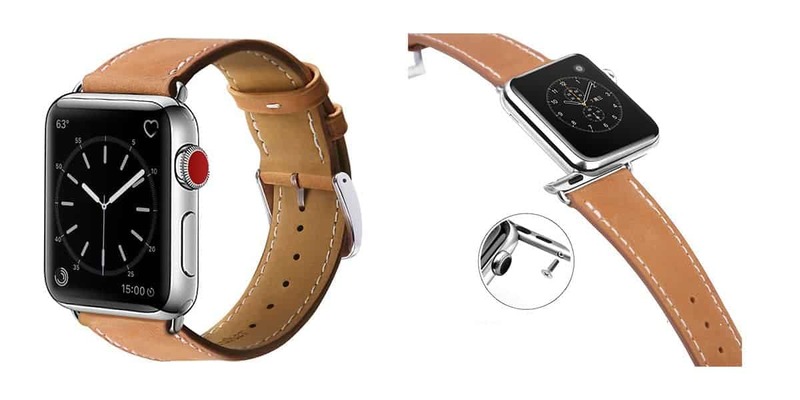 Mifa’s leather for Apple Watch is a great strap that fits all models. These are handmade from genuine soft leather and feature an anodized black stainless steel clasp that matches the face of the Watch. They come with steel adapters and a buckle fastening mechanism, which allow for a quick and easy (slid in – slid out) installation. And they are available in three different colors: black, brown and oyster gray. Mifa’s band is a great strap for watch that is a lot more affordable than the first party leather alternatives offered by Apple. And if you’re worried about the quality, MIFA offers a lifetime warranty on its products. So that should be a huge plus. Has a premium soft build with anodized black stainless steel clasp. One band size will fit all wrists sized between 17-29cm. Comes with a life-time warranty. Not suitable for working out or swimming. Clockwork Synergy’s Classic Nato is a nylon strap made from high-quality material that is extremely durable. The best thing about these are the tonnes of color combinations available (much more than the options available for Apple’s own nylon bands). Also, the buckles and the adapters are available in multiple colors to perfectly match the Watch. These are light and comfortable to wear and they come with 11 adjustability holes, to ensure the perfect fit for everybody. All in all, a great alternative to the first party nylon. And the price is very reasonable. Strong nylon strap and highly resistant to sweat and water. Lots of color variations available. Some people may not like the stiching. 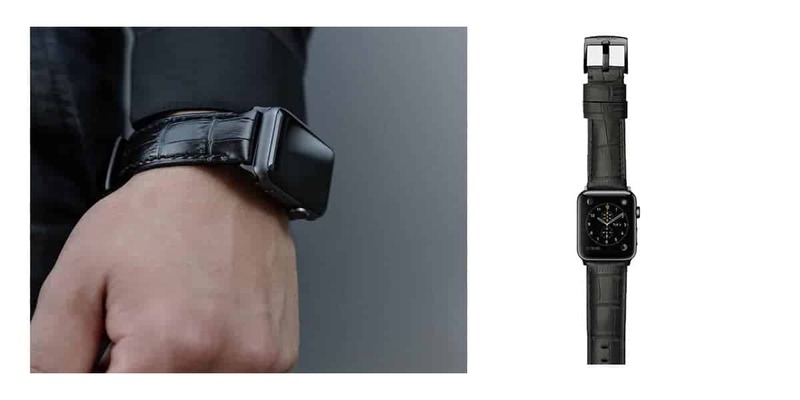 Marge Plus’s leather band for the Watch is a great alternative to the first party. These are crafted from top quality leather. And they feature stainless steel connectors and a polished stainless steel buckle. These straps are comfortable to wear and like with any leather strap, great to look at. The manufacturers claim that these straps are sweat-absorbent. 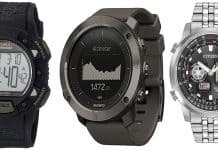 For like with any strap, they may not be ideal for working out or partaking in any physical regime. 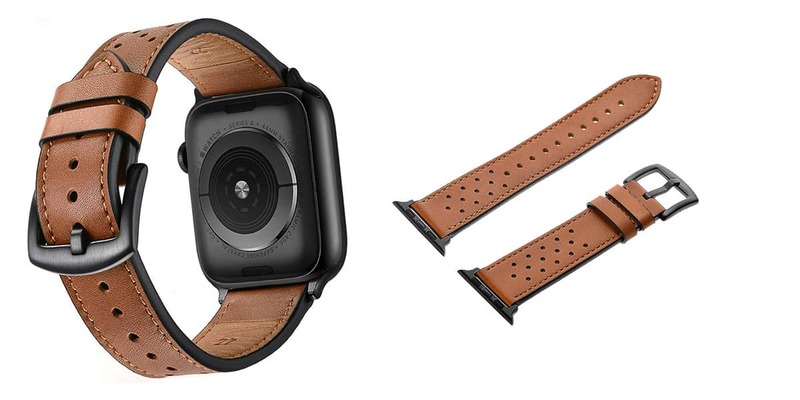 Marge Plus’s leather for the Apple Watch come with an 18-month warranty and is, without doubt, a great bang for the buck leather strap. Is quite comfortable to wear and also, it looks great. One size will fit all wrists sized between 16-20cm. The price seems like quite a bargain. The real color of this strap may vary slightly from the pictures used to advertise it online. Quality isn’t as great as other more expensive leather. Ouiledi’s Stainless Steel Mesh are made from beautiful and durable woven stainless steel. This is available in several different colors ranging from gold, pink or silver to black. 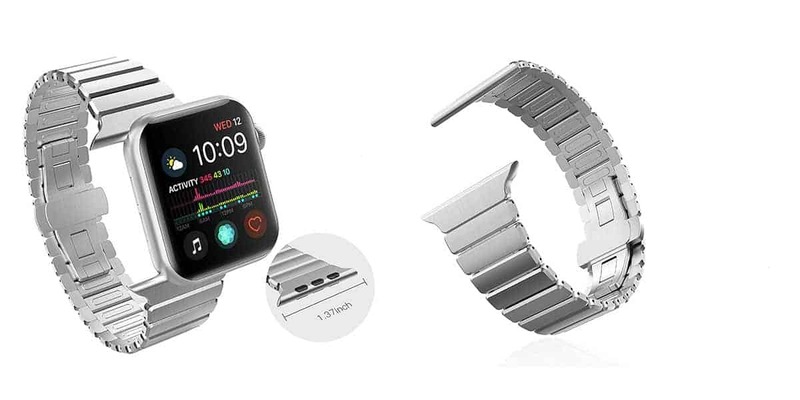 The strap features a full magnetic closure, meaning it will fit perfectly and comfortably around your wrist. To add to that, the straps are fully adjustable. They are available in two different sizes. The 38mm/40mm version and the 42mm/44mm version. Hence, they can support every version of the Apple Watches. Ouiledi’s Stainless Steel Mesh is definitely a great alternative to the first party Milanese loop sold several times this price. Ouiledi claims to use durable material and ergonomics design techniques to create. This guarantees both comfort and quality. Available in fifteen different designs of spectacular colors. Uses magnetic closure to ensure they don’t bulge during the course of the day. Not the friendliest one to go running, swimming or wear to the gym. AdMaster‘s silicone for the Apple Watch is a well-priced perfect for your workout sessions or exercise regimes. They are made of high quality silicone and flexible elastomer, that make it both durable and give it a soft feel. The design allows for airflow, thus making it more comfortable and suitable for workouts. They are available in a range of colors and two different sizes. In some ways, AdMaster’s silicone for the Apple Watch are a great alternative to even the Nike Sport band featured on this list. The quality may not be in the same league, but they are available for a fifth of the latter’s price. A great thing about cheaper bands is that they can always be replaced with less worry! Material is durable, making it a perfect band to go running, swimming or wear to the gym. Price is quite a bargain. Comes with a 30-day money back guarantee and a 34-month quality gurantee. Does not have a 44mm option. Can cause wrist rashes if not kept clean and dry. iGK’s Sport is another great silicone and the least expensive featured on this list. These are flexible, lightweight and have a comfortable feel on your wrist. They are made of soft and durable silicone, meaning they are unlikely to cause any irritation on your skin, just so long as you keep them dry. And the metal parts are made of hypoallergenic stainless steel. Like all silicone bands, they are sweat and water resistant, making them ideal for your swimming or workout sessions. And they are available in a range of colors, to match your mood and taste. iGK for the Apple Watch is a silicone strap, not to mention incredibly affordable at less than 10$. You could actually buy a few of these, and leave one in your gym bag so that you will always have a replacement available for your workout sessions. Made of durable soft silicone that is sweat and water resistant, making it ideal for workouts or swimming. 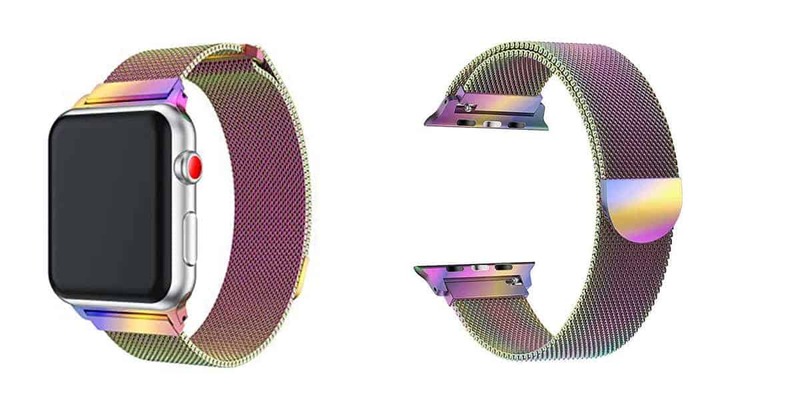 So that concludes our list of the best Apple Watch bands for 2019. We’ve tried out best to include bands of every style and for all purposes. Some are ideal for workouts, others for show. Some may be practical for both, but with slight compromises on both ends. Before you make your purchase, ask yourself what it is that you see yourself doing the most with your Apple Watch on. Then choose the band that’s right for you. Hope this list helps you in making that decision! And if it did, you might also love our reviews on phones and cameras. Do check it out!